Colosseum or Coliseum (Flavian Amphitheatre) It was built in Rome Italy about 1920 years ago. It is the Largest ever built in Roman Empire and considered as one of the greatest works of Roman Architecture and Roman Engineering. The Colosseum today is now a major tourist attraction in Rome with thousands of tourists each year paying to view the interior arena, though entrance for EU citizens is partially subsidised, and under-18 and over-65 EU citizens' entrances are free. It was the first permanent amphitheater to be raised in Rome, and the most impressive arena the Classical world had yet seen. And with accommodation for 60,000 seated and 10,000 standing, all of whom could enter and leave in a matter of minutes, courtesy of 80 entrances, this is a structure that the designers of modern sports stadium could learn from. 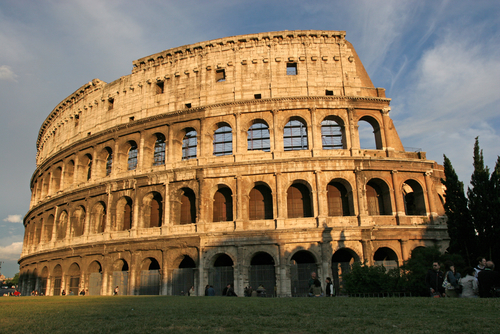 The Colosseum saw around 450 years of service as Rome’s entertainment center. Architectural historians have read many alterations and additions to Vespasian original structure. In 217AD the higher storeys were wrecked by fire, and there were earthquakes in 442, 470 and 847AD. softened and civilized as Christianity took hold, but the decline is probably down to a lack of cash. The Roman empire was faltering. A series of invasions by Goths, Huns and others were weakening their hold and the revenue being pulled in from its territories and Games were expensive.